The aardvark looks like a few other animals — the anteater, the armadillo, the pig — but it's closely related to none of them. It may be one of the world's few unique creatures. Nature is inventive and therefore crowded. If one design proliferates, it spawns variations of itself, which is why weasels can be related bears and pigs can be related to giraffes. There are few species that stand alone, without near relations. The aardvark is one of those animals. At first it looks a lot like an anteater with its humped back and its long snout. While the two animals would undoubtedly have a lot to talk about ("You like ants? Get outta here! I like ants, too!") their similarities aren't rooted in ancestry. The aardvark, when examined more closely is very much alone in the world. Its teeth, a bunch of dentine tubes glued together by a substance called cementum, mark it as one of natures few unique creatures. The aardvark is the only member of its species. It is the only member of its genus. It is the only member of its family. And it is the only surviving member of its order. To put that in perspective, humans are members of the species Homo sapiens and the genus Homo. Which sounds unique until you realize how much Neanderthal — species: Homo neanderthalensis, genus: homo - and other early people we're constantly finding in our DNA. We're members of the family Hominidae, which includes orangutans and chimpanzees. And we're members of the order of primates, which connects us to lemurs and aye-ayes. The picture on the left is an aye-aye, believe it or not, more closely related to a thing that looks like a strung-out opossum than aardvarks are related to anything at all. The fact that everything even remotely related to the aardvark has been killed off isn't a great sign for its survival as a species. Then again, it does have the run of southern Africa. 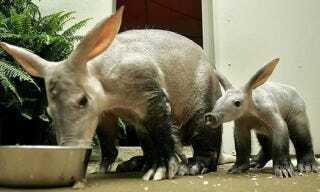 Perhaps one day the tables will be turned and we'll all live on the planet of the aardvarks.